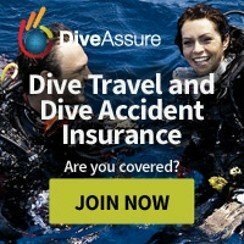 Deep stops & Decompression stops in diving, what are they about? Deep stops, what are they about? 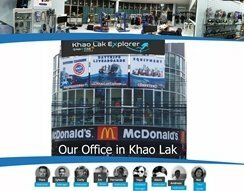 You may have heard of them, or experienced divers – especially those who are technically trained – might have mentioned them to you in a conversation, you may even have read a thing or two about them. 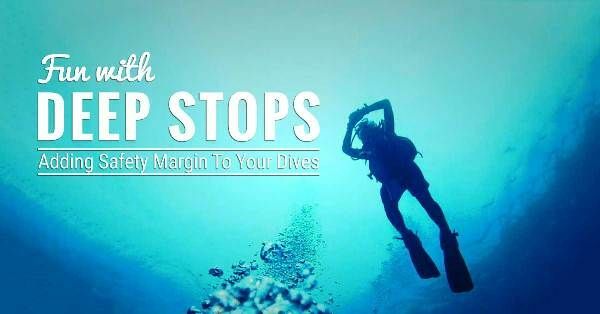 But the question remains, what the heck are deep stops, and why is it useful to know about them as a recreational diver? In the last 15 years or so, deep stops have made a slow but steady progress on their way from the closeted realm of technical diving into the everyday recreational scuba diving. 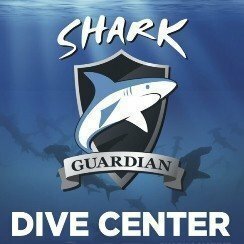 Their progress has been so pervasive that even computer manufacturers have relented, and today many recreational dive computers have deep stops built into their algorithms. Today’s diving computers utilize a very simple method to indicate a deep stop to the user. 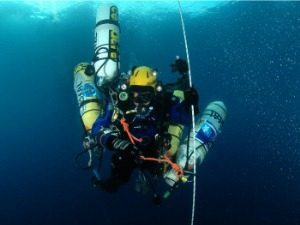 Most computers indicate a decompression ceiling for the diver as he begins his ascent, even if the diver has no decompression obligation. This ceiling, which is much deeper than any decompression stop ceiling, only lasts for one to two minutes once the diver reaches it. The diver can then resume his ascent as normal. But what we want to know is why all the fuss about deep stops, what are they and what do they do? Casting an eye back in time, it becomes quite apparent that this whole new part of decompression theory and its development is mainly due to the genius of one man. 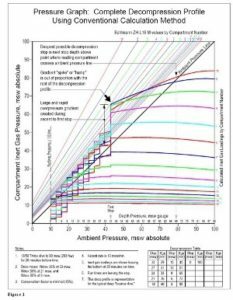 The early 90’s was a great time in our understanding of decompression theory, as well as some big jumps in the quality and technological innovation of dive equipment. One of the biggest contributors to decompression theory was Dr Richard Pyle. The Doctor, who is an Ichthyologist (someone who studies fish), regularly conducted dives while working for a museum and research center in Hawaii. His diving, which was a mix of recreational and technical, resulted in him making a few observations that piqued his scientific curiosity, and the end result was the creation of deep stops. The question that Dr Pyle tried to answer was a curious one, since over time he had noticed that although he conducted thousands of dives, sometimes he felt very fatigued after dives, and sometime he felt absolutely fine. This question really bothered the enterprising doctor since the event occurred on many dives that for all intents and purposes where identical. There had to be a reason why. Like any self-respecting scientist, Dr Pyle began by applying his scientific method to the problem, and the first thing he had to do was amass a large solid data set to enable him to reach any viable conclusion. Dr Pyle began to meticulously record in great detail the events of every dive he was doing. After collating the data and studying it, he came to one stunning conclusion: the dives that resulted in less fatigue were the ones he collected a fish sample on. Dives where he did not collect a sample were the dives that made him feel fatigued post dive. At first, the solution seemed psychosomatic – surely, Dr Pyle reasoned, it could not be a psychological high that “getting a fish” led to less fatigue! After all, he was an experienced scientist who had collected hundreds if not thousands of specimens, he was not a giddy new researcher happy with a fish. He would have to dig deeper to find out the truth. After going back and looking at the data again the enterprising doctor finally had his eureka moment. He realized it was nothing to do with psychology, and had everything to do with exploding fish. Fish have a unique way of controlling their buoyancy; inside the fish, there is a swim bladder that the fish uses like a BCD. The fish adds and removes gas from this bladder to control its buoyancy. When you capture a fish specimen and starts to ascend with it, you have to stop for a minute or so and use a syringe to release some of the expanding gas from the specimen’s swim bladder. If the diver does not do this, the swim bladder will explode on ascent and ruin the sample, and this is exactly what Dr Pyle was doing every time he collected a sample. 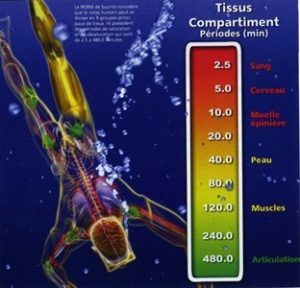 He realized that these stops, which were much deeper than his normal decompression stops, not only allowed the doctor to bleed out gas from the fish, but also allowed his own body to release small amounts of gas from his fast tissues. Thus preventing the formation of micro bubbles later in the dive or post ascent. The doctor went on to publish his findings and develop a mathematical formula for calculating his way of doing deep stops, and from that day on Pyle stops and deep stops were born. Needless to say, since those heady days there has been more and more research as divers have taken a keen interest in developing this new branch of decompression theory. 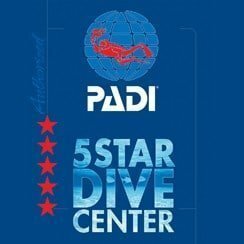 I only dive recreational; do I really need to bother with deep stops? Not necessarily, but they are a good idea, any recreational diver worth his salt does a 3-minute safety stop at 5 metres after almost every dive, why? 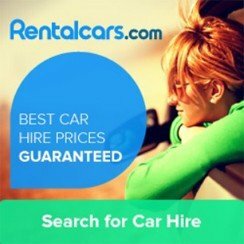 To allow their tissues to off gas and reduce the risk of bubbles forming after surfacing. It is exactly the same with using deep stops when recreational diving. Think of them as much deeper safety stops that basically control your ascent speed and clean up the ascent profile. They are a tool that although not mandatory, you would be wise to use. 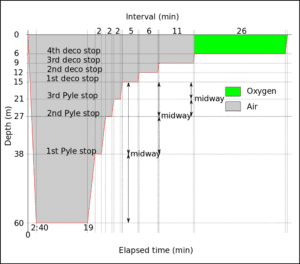 As a recreational diver, what is the best deep stop methodology to use? It can be quite complex to try and work out Pyle stops or some of the other more technical diving oriented methodologies and implement them during a recreational dive. One of the best and the easiest to implement is based on the WKPP (Woodville Karst Plains Project) stop strategy. 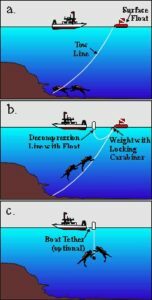 This strategy entails an initial slow ascent to 80% of the maximum depth of the dive, followed by a gradual ascent in 3 meter increments with at least 30 seconds stop at every level. 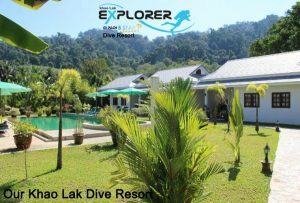 Simply put, a 30-meter dive would have an ascent to 24 meters, stop for a minute then 21,18,15,12,9, etc. and at each subsequent level, there would be a at least a 30 second stop at each level. So, are there any other deep stop methodologies? Since the time of Dr Pyle, there has been a few methodologies that have been developed. Most of these remained firmly ensconced in the technical diving community, since they attempted to address a fundamental problem with Pyle stops. That is that they did not reflect actual tissue gas loading. Some of these methodologies include gradient factors, micro bubble stops, Gas Volume expansion stops, as well as the above mentioned WKPP stops. Today for technical divers the industry standard is gradient factors, since they are based on tissue loading, and are relatively easy to incorporate in dive plans and software. Are there any new developments in deep stop theory? In the last couple of years there has been one or two research papers that have questioned the validity and underlying theory behind deep stops. However, it must be noted that at this present time this research is still in its infancy and has not been substantiated yet. On the other hand, from experience we do know that deep stops actually work, and have been used by thousands of divers for thousands of dives over the past 20 years. Find out more about decompression theory.